The Trump administration is rushing through management plans for the Bears Ears and Grand Staircase-Escalante National Monuments that would hand over millions of acres of public lands to fossil fuel and mining companies. If the administration gets their way, lands that were illegally cut out of our irreplaceable monuments would be devastated by drilling and mining for coal, oil, gas, and other minerals. The Trump administration is asking for input on these plans from you — the owner of these lands — but only for a brief time. 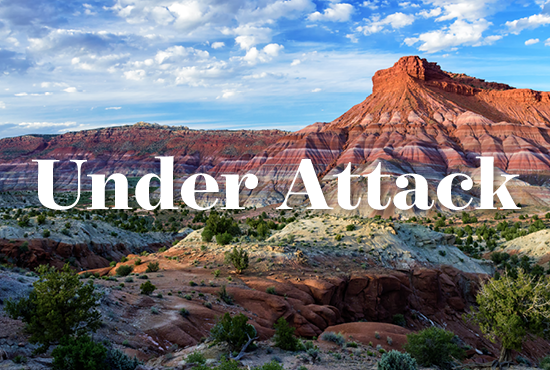 Send a message demanding the Trump administration withdraw their reckless management plans that would destroy the Bears Ears and Grand Staircase-Escalante National Monuments. The Trump administration is rushing through management plans for the Bears Ears and Grand Staircase-Escalante National Monuments that would hand over millions of acres of these public lands to fossil fuel and mining companies. Send a message demanding the Trump administration withdraw their reckless management plans that would destroy our national monuments. Dear Acting Secretary Bernhardt: I am outraged by President Trump's decision to roll back protections for the Bears Ears and Grand Staircase-Escalante National Monuments and call on you to immediately withdraw your reckless draft management plans for these illegally redrawn monuments. President Trump's proclamations stripping protections for these two monuments are unlawful. The president has the authority to create a national monument under the Antiquities Act, but only Congress can revoke or reduce a national monument. Rushing forward and proposing draft management plans for Bears Ears and Grand Staircase-Escalante that throw open millions of acres of this cherished public land to drilling and mining before the courts rule on the validity of the President’s proclamations is irresponsible. I urge you to withdraw the reckless draft management plans for Bears Ears and Grand Staircase-Escalante until the legitimacy of the President's proclamations is settled by the courts. Thank you.